When you’re twelve and you fall on a patch of ice, trip over a sprinkler, or fall out of a tree, it hurts. You probably scrape something, and certainly you’ve got some bruises. Somewhere there is an adult who will fix things, make things better. When you’re 25, you’re bigger, clumsier, and responsible for your own health insurance premiums. When you’re 40, falling on a patch of ice looks like it will hurt. A lot. When you hit 70, a bad fall might mean permanent loss of mobility. It tells your children, your doctor, that you are more helpless. In fact, the fear of falling among elderly is considered more disabling than falling itself. For the elderly, falls are the leading cause of injury deaths, and the most common reason for trauma admissions to the hospitals. Studies have shown, and common sense makes clear, that active martial artists have a much lower risk of falling. They have better balance, more strength in almost every part of the body, and a better connection to their environment. Many are trained to fall with little or no injury even if they do fall. And, because they are confident, they don’t face the debilitating effect of fear of falling. Traffic, jobs, relationships, and taxes. People who don’t tip. Littering on the metro. The adult world is full of things that hold you up, make you angry, assault your senses, and just keep adding up to bring more and more stress. You might not want to use your martial skills to take out other drivers or the IRS, but the fact you can go beat on a heavy bag, kick targets, and spar with a variety of opponents makes all those other things less important. One study, attempting to show the stress relieving effects of exercise, decided to use a non-stressful martial art (Tai Chi) as a control group. Unfortunately for the study group, the control group showed as much stress reduction in terms of reduced blood pressure, etc., as the group being studied. Tae Kwon do, of course, provides both advantages. Aging, to most people, means more than getting older chronologically. It brings up visions of health problems, losing hair, losing bones, gaining weight, skin loosening up, and people honking at you because you don’t remember which way to turn. People fear that we will be passed by, dated and marginalized by a youth culture that is constantly finding new things to embarrass us with. It doesn’t have to be that way. Many studies show that the mind stays sharp if it is constantly learning new things, and the evidence that exercise staves off almost every indicator of age is overwhelming. More importantly, the martial arts are closely intertwined with traditions that take long lives and healthy living seriously. Old masters not only exist, many are known for outshining the young. I’ve seen footage of a 100 year old Kung Fu master competing in Beijing, and I’ve seen a 70 something Tae Kwon Do practitioner speed break boards with a glass of water on his head. Then he dropped and did 100 pushups. Many activities celebrate the young. 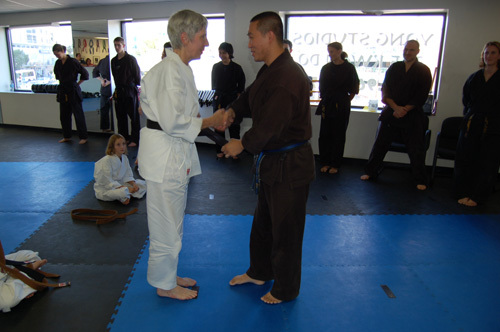 Tae Kwon Do certainly welcomes the young, but it celebrates and respects the old masters. As we go through different stages in life, we lose friends, drift away from family, and it’s not always easy to find new ones. We leave home, we graduate from school, we go out into a different working world, and friendships don’t come as easily as they once did. One of the best way to make friends and form relationships of any kind is to get into something active, something that brings us together with others and provides a common interest. One of the best ways to do this is to learn a martial art. It offers a lifetime of learning, contact with a wide variety of people, and a place you can always go.